This blog explores events in the year 1812 as they happen. 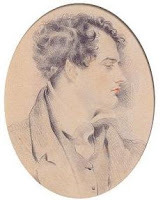 On November 6, 1812, Lord Byron writes again to Lady Melbourne sharing the latest gossip but being careful to use initials or dashes to disguise who he is discussing. He does this in case Lady Caroline Lamb or servants later read his correspondence. For example, he refers to a P who is identified by Peter Cochran as the attractive Lady Frances Wedderburn Webster, on the right. He writes: "So – a new accusation of imposition! 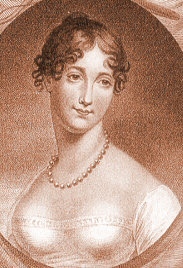 – At M– & before – my memory really fails me – I never laughed at P – (by the bye this is an initial which might puzzle posterity when our correspondence bursts forth in the 20th century)" Byron also schemes with Lady Melbourne on how to contain Lady Caroline Lamb or as he terms it "on the arrival of Pandora (& her boxes of evil for all her acquaintance) at Tixal". Byron's letter is reproduced below. So – a new accusation of imposition! – At M– & before – my memory really fails me – I never laughed at P – (by the bye this is an initial which might puzzle posterity when our correspondence bursts forth in the 20th century) nor can I possibly pronounce where all was “proper” who was the “properest” but I am sure no one can regret the general propriety half so much as I do. – Though we are very quiet & wish to remain so as much as C— & others may permit, yet we are also determined to abide by our articles & not to relinquish a single right – (read – “wrong” – instead if you like) – which devolves to the Conquerors on such occasions – As to the Ly. Blarney, though I expected some absurd dissatisfaction on her part, I own it provokes me. – “Unfair” who could act fairly with people who were sending couriers & threatening to follow them? – As to C— she will find her in fits for the Winter without me to help her, depend upon it – & unless Providence sends another illness & journey it is all over with my successor – I guess at Webster (who is now in Parliament & will be in town more) as the first essay, but I doubt the Bart. himself as somewhat of the coldest. – Besides he must sacrifice his senatorial duties, & do nothing else but attend to his perplexities, which will be manifold. – – I presume that I may now have access to the lower regions of Melbourne House from which my ascent had long excluded me. – I doubt if C— & I will be on speaking terms, & it is on the whole much better we should not, but I trust the taciturnity is not to be general. – Your threatened visit of C— to this place would have no effect in this quarter, all being secure. I shall go to Middleton shortly after the twelfth Inst. – address your Answer there or to Cheltenham – I hope to find you at M. – You see nothing makes me unmindful of you, & I feel but too much obliged by your reciprocal remembrance. ever my dear Ly. M. yrsmost affectly. I am a lawyer who lives in Toronto with my wife and son. I can also be found on @fernsouza.